Sometimes I get in heated discussions (arguments?) about food. I don't mind them; disagreement is what makes the world go round, and I actually don't mind finding out that I'm wrong about something. And, sorry if this seems patriotic, it's not, but it's the United States. As exhibit A, I would like to present one of my favorite pastries, the sweet potato cinnamon roll. Maybe you know what it is to eat a cinnamon roll hot out of the oven. Maybe you don't. But I swear to you that these are a world of their own. The rarity of a completely homemade cinnamon roll already puts these at an advantage, but the sweet potato gives the dough an edge, making the finished product shockingly tender. It takes time, but most can be done the night before and it is soooo worth the wait. Every aspect of these is perfect. When I can't get my hands on pecans, that American nut, I sub with walnuts. Rarely is a dessert so fun to make. Rolling up the dough around the filling, then slicing what you know will turn into the most delicious of breakfasts-it's so satisfying. So, whoever wants to try to convince me that the USA doesn't have the best desserts and pastries can do so in the comments section. Stir together yeast, 1/2 cup warm water (100° to 110°), and 1 tsp. sugar in a 1-cup glass measuring cup; let stand 5 minutes. Combine yeast mixture and 1/2 cup flour in a mixing bowl; stir vigorously until mixture is well blended. Gradually add mashed sweet potatoes, next 7 ingredients, and 4 1/2 cups flour, stirring until well blended after each addition. Turn dough out onto a well-floured surface, and knead in remaining 1/2 cup flour. Continue to knead until smooth and elastic (about 4 to 5 minutes). 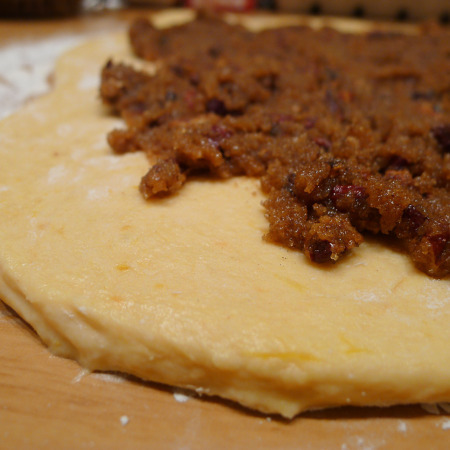 Place dough in a large bowl coated with cooking spray. Cover with plastic wrap, and let rise in a warm place (85°), free from drafts, 1 hour to 1 hour and 30 minutes or until doubled in bulk. Punch dough down. Turn dough out onto a well-floured surface, and roll into a 10- x 18-inch rectangle. Spread evenly with Filling, leaving a 1-inch border. Roll up dough, jelly-roll fashion, starting at 1 long side. Cut into 12 (1 1/2-inch) slices, and arrange in a lightly greased 13- x 9-inch baking pan. Cover with plastic wrap, and let rise in a warm place (85°), free from drafts, 30 minutes. Bake rolls at 400° for 10 minutes. Remove rolls from oven; drizzle about 1/2 cup Glaze slowly over rolls, starting at 1 edge of pan and drizzling in a circular pattern; let glaze soak in. Repeat procedure with remaining Glaze. Bake rolls 7 to 10 more minutes or until lightly browned and a wooden pick inserted in center comes out clean. Remove rolls from oven, and invert onto an aluminum foil-lined baking sheet. Invert again, glaze side up, onto a serving platter. Let cool 20 to 30 minutes. Serve warm. Stir together sugar, corn syrup, and butter in a small saucepan over medium heat. Bring to a light boil, stirring constantly. Remove from heat, and stir in cream and vanilla.